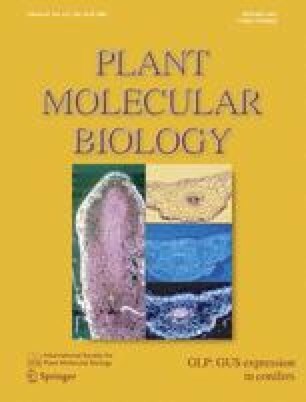 The transcript level and in turn protein density of the K+-uptake channel ZMK1 in maize (Zea mays) coleoptiles is controlled by the phytohormone auxin. ZMK1 is involved in auxin-regulated coleoptile elongation as well as gravi- and phototropism. To provide unequivocal evidence for the role of ZMK1 in these elementary processes we screened for maize plants containing a Mutator-tagged Zmk1 gene. In a site-selected approach, we were able to identify three independent alleles of Mutator-transposon insertions in Zmk1. zmk1-m1::Mu1 plants were characterised by a Mu1 transposon inside intron 1 of ZMK1. When we analysed the Zmk1-transcript abundance in growing coleoptiles of these homozygous mutants, however, we found the K+-channel allele overexpressed. In consequence, elevated levels of K+-channel transcripts resulted in a growth phenotype as expected from more efficient K+-uptake, representing a central factor for turgor formation. Following Zmk1 expression during maize embryogenesis, we found this K+-channel gene constitutively expressed throughout embryo development and upregulated in late stages. In line with a vital role in embryogenesis, the mutations of exon 2 and intron 2 of Zmk1-zmk1-m2::Mu8 and zmk1-m3::MuA2-caused a lethal, defective-kernel phenotype. Thus, these results demonstrate the central role of the auxin-regulated K+-channel gene Zmk1 in coleoptile growth and embryo development.